Master Python and become a programmer-even if you never thought you could! This breakthrough book and CD can help practically anyone get started in programming. It's called "The Hard Way," but it's really quite simple. What's "hard" is this: it requires discipline, practice, and persistence. Zed A. Shaw teaches the Python programming language through a series of 52 brilliantly-crafted exercises-all formatted consistently, and most no longer than two pages (including "extra credit"). Just read each exercise, type in its sample code precisely (no copy-and-paste! ), and make the programs run. As you read, type, fix your mistakes, and watch the results, you'll learn how software works, how programming works, what good programs look like, and how to read, write, and see code. You'll discover how to spot crucial differences that fundamentally affect program behavior, and you'll learn everything you need to know about Python logic, input/output, variables, and functions. Above all, you'll learn the attention to detail that is indispensable to successful programming (and so much else in life). At first, yes, it can be difficult. But it gets easier. And Shaw offers plenty of extra guidance and insight through 5+ full hours of teaching video on the accompanying CD. As Shaw's thousands of online readers and fans will attest, the moment will come when you just "get it"-and that moment feels great. Nothing important comes without discipline, practice, and persistence. 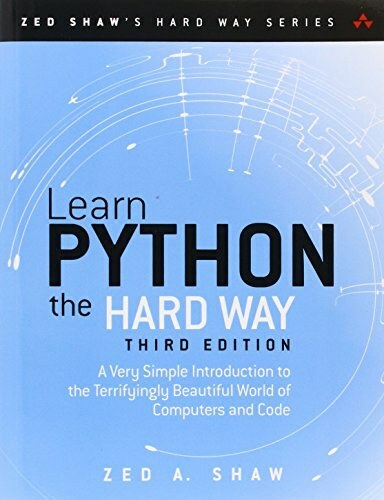 But, with Learn Python the Hard Way, readers who bring those qualities to programming will master it-and they will reap the rewards, both personally and in their careers. Read this book for Jenny. 英文原句：What you get when you tell Python to create a class. 勘误： for循环只能对一些东西的集合进行循环，while循环可以对任何对象进行驯化。 此处“驯化” 疑似印刷错误 原文为“循环”。 英文原文 ：A for-loop can only iterate (loop) "over" collections of things. A while-loop can do any kind of iteration (looping) you want. 英文原文 ：A for-loop can only iterate (loop) "over" collections of things. A while-loop can do any kind of iteration (looping) you want.